Sometimes I feel like I can only blog about the new things I buy. Or sometimes I think that once I have featured an article of clothing on my blog than I can no longer do a post about it unless I "radically" reinvent how I style it. However, it's fun to celebrate the pieces in your closet that you love and return to over and over again. Plus, new people are always discovering your blog, so it's fun to share favorites from your closet that haven't been featured in a while. This shoe skirt from Eva Franco is one of my top five favorite skirts. It's a sea of ballet flats that kind of resembles what my closet looks like! It has so many colors featured on the print that it seems to go with just about everything. I wear it all the time, for all seasons and I don't think I'll ever tire of it. My jeweled collar shirt and metallic mirror pumps are also standby favorites that I get a lot of use out of. While I try to give equal love to all of the things in my closet, it's hard not to have some favorites! That's a really cute skirt. I like Eva Franco a lot, as a brand. Great look!! Love it!! Shoes, skirt, blazer, blouse are amazing! That skirt with the adorable, multi-colored ballet flats is so fun and unique. Great pastel blue blazer also. Eva Franco makes great things! That's such a fun skirt! No wonder it's a favorite! I feel the same way about featuring items. It's silly. 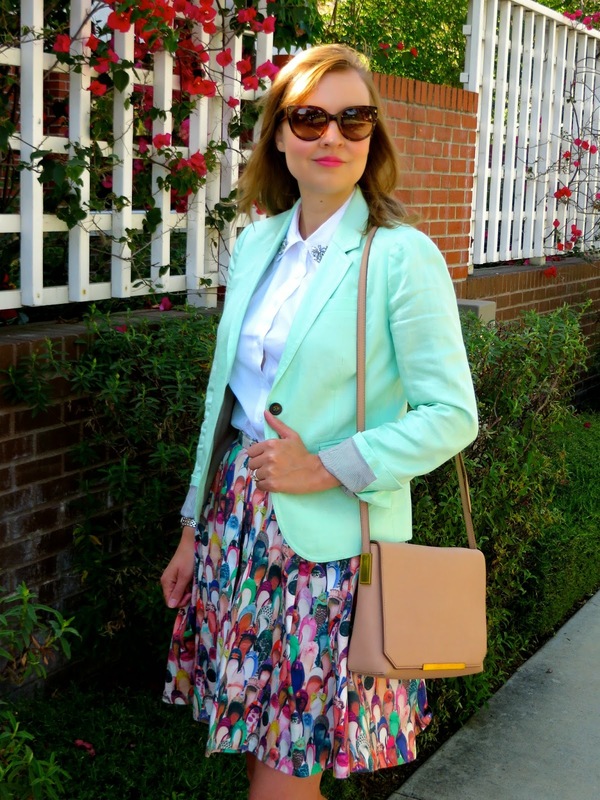 Personal style blogs should really be about what we actually wear--especially favorites! That is the cutest skirt I've seen in a long time!!! The whole outfit looks great on you but that skirt is just awesome!!! I love this tailored look Katie! Gorgeous from head to toe. Fun skirt!